Elegon VS. Brewmaster. At least a brewmaster who may be doing it right, My healers call me squishy. Earlier this week I bullet pointed my first impressions of Elegon in Mogushan Vaults. One of the bullets was that for the first time I really really needed to manage my resources. I want to take a closer look at these resources. Both how I had been managing them in the previous 4 fights, and how I can improve for this fight. So lets start with what I consider Brewmaster’s resources. First and foremost our Chi reliant resources: Shuffle, Guard, and Purifying Brew. Lets start with the bread and butter basics (look Mrs. Hunter aliteration) shuffle, and stagger. I have always made my shuffle uptime The priority, and I dont think this is wrong. Making a large portion of physical damage be under my control is one of the things i like best about my class. Of course I cant talk about shuffle and stagger without discussing Purifying Brew. 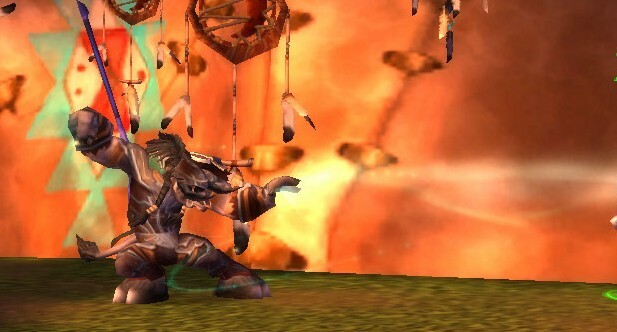 First I have tied my Relic of Nizao trinket to purifying brew to make sure it gets used regularly. On the first 4 bosses I have been able to use this skill liberaly, rarely have my staggers gone yellow (medium) I usually clear them beetween 8k and 11k a tick. On Elegon I am trying to let my stagger ride a bit higher(between 15k and 17k), especially when my debuff stacks are low. This is because I found myself having a bit harder of a time keeping my shuffle rolling. I have consistantly run with guard glyphed so far this tier. The main reasons for this are that we do so well mitigating physical damage that Guard seems better used as just a magic reduction cooldown. And this really shines on Elegon’s breath attack. The second reason is that the guard that our statue puts on our allies also is straight magic reduction which is great for the finger wigglers hidding behind the boss. So I have gotten in the habit of refreshing it every 30 seconds on fights like Stone Guardians, Feng, and Garagal. Saving it for an on use in the Elegon fight has been a big adjustment for me, and had added to my struggle with my Chi Bar. Fortifying Brew, Diffuse Magic, Elusive Brew, and Avert Harm. I try to use them in this order on celestial breath: Guard, Diffuse Magic, the Fortifying Brew, so as my stacks go up my cooldowns get stronger. (I dont do anything on the first one, and count on my healers getting me through it. Don’t tell them that.) I will usually use my Elusive Brew whenever I get more than 5 stacks to hopefully avoid some melee swings. And I have never Used Avert Harm, the tool tip is scary but i may need it in this fight. I usually use the Celerity talent for the extra roll it provides. Don’t ask me why or how it affects my raiding. It is just nice knowing if I need to GTFO I can go a long way fast. It is kind of like my daughters red blanket. I switched to momentum for our second night of work on the celestial sky dragon of doom, and the extra run speed was a huge boon for stack clearing. Much to my chagrin when we started our second night of work I was moving some buttons around on my bars and noticed my Transcendance button sitting down in the corner all by itself and lonely. I immediatly smacked myself in the head and dropped my copy right outside the circle. I completly forgot I had it as an option. As stated previously I am an idiot. Use Transcendance on this fight and impress your friends. Of course all this is me just talking to myself, as usual. This is not necisarrily best practices. We havent even killed the boss yet, but we will, eventualy, probably.